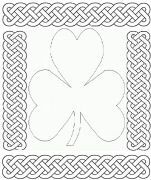 A shamrock coloring page is just what may be needed to get the kids interested in their Irish heritage, or just for fun around St Patrick's Day. Get out some coloring pencils, marker or crayons. Below are some simple pages to enjoy. Just click on the images to get a full pdf version to print off. And if you'd like to submit a shamrock coloring page yourself, we'd love to hear from you as we hope to add to the collection. The shamrock is the most popular Irish symbol with a real history and legend behind. Though people often use the word clover for shamrock, the Irish shamrock is smaller. 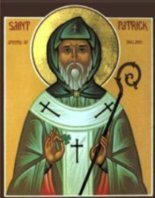 Traditionally adults wear a sprig of shamrock in their lapels on St Patrick's Day. You should check out our shamrock symbol page for more information. And of course please feel free to send us your shamrock story or questions. We'd love to hear from you.